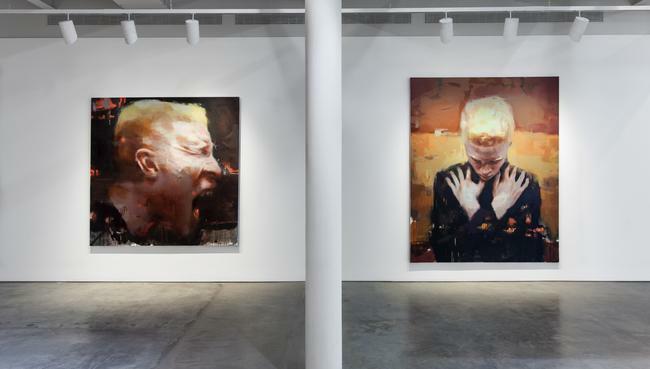 DRISCOLL BABCOCK GALLERIES presents Visible Man, Jérôme Lagarrigue’s solo exhibition and first series of paintings documenting the model-muse, and albino African American male, Shaun Ross. Like its title, the exhibition, while evoking Ralph Waldo Ellison’s Invisible Man, transcends, though does not ignore, race in order to expose the humanity of Ross, a public figure in the fashion industry who fatefully caught Lagarrigue’s attention one morning in a Miami hotel lobby for reasons other than his celebrity—unknown to Lagarrigue at the time. Lagarrigue, observing the light’s transformative effect on Ross’ pigment-less hair, eyes and skin felt a revelation, his life’s moment of awakening—that he had found in Ross everything he had been waiting for as a painter. 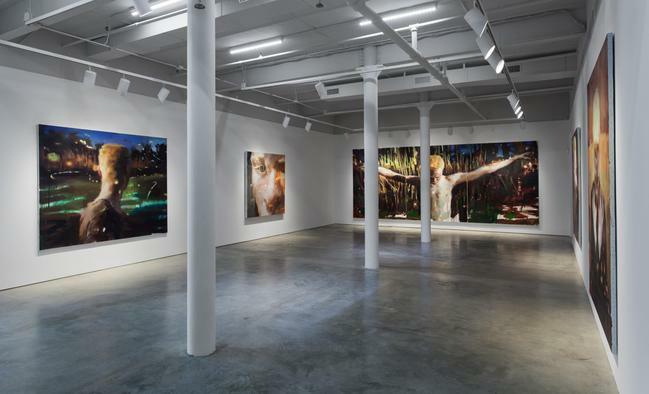 He photographed Ross on the spot and, upon returning to his New York studio, immediately began painting. This series soon ensued as the creative and spiritual bond between the two unfolded. It is impossible to overstate the historic misunderstandings of people born with albinism. It is yet another chapter in mankind’s negotiation with its superstitions, prejudices and hypocrisies. On one hand, in some parts of the world, albinos are thought to possess a magic that will bring prosperity to the practitioner. On the other hand, people with born albinism have also been ostracized, persecuted, and even killed for being different. It is ironic then, that Ross’ utter uniqueness has propelled him to international fame. Yet, Lagarrigue sees in Ross’ lack of melanin an artistic challenge—the opportunity to explore notions of color, light and pigment in a meaningful way. In Genesis, 2014, Ross exists against a cool-toned background, a palette that Lagarrigue had to develop over time, as Ross’ own natural palette—a new one for Lagarrigue—could not properly be expressed by his usual warm-toned backgrounds. Lagarrigue’s evolution to blue, serendipitously the color of the Miami hotel lobby where the two met, mimics his genesis of artistic partnership with Ross as they discovered the most successful moments of collaboration exist at dusk, when blue, diffuse light allows Shaun’s light-sensitive eyes to open and shine with a wheat-like hue. Visible Man is not a documentation of Ross’ career, nor an exploration of the politics of race. Like their chance encounter, this series is the product of organic events, of accidentals, of Lagarrigue’s cinematic observations of Ross in his natural state—at times protective, at times confident and comfortable in his skin, at times vulnerable. In Entre Chien et Loup, 2014, Lagarrigue paints Ross into the environment at dusk—the moment of evening when, as the painting’s title directly translates to, one can no longer distinguish dog from wolf. This moment in time blurs visibility, merging the trained and suppressed with the wild and free. In such a way, the illusory effects of dusk transform Ross’ physical body, turning his eyes, skin and hair into wheat, allowing him to unfold his truest humanity as he blends into the natural wheat field behind him. Here, Ross is one with the world. 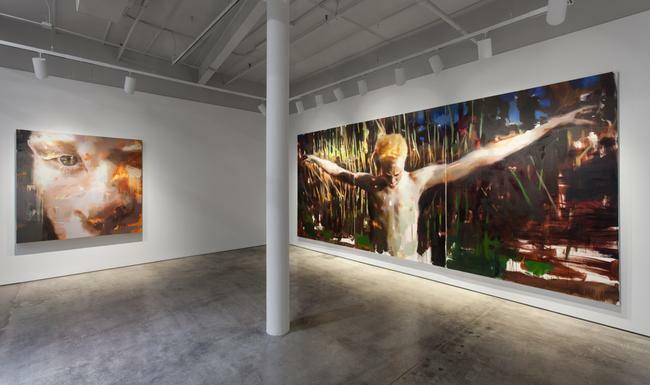 Arms outstretched across three panels, raw in the flesh, flesh raw with pigment, Lagarrigue understands that Ross, resembling the crucifixion, is nevertheless going to be subject to our interpretation, vulnerable to our suggestive impulses. The transcendental nature of Lagarrigue’s painting culminates in Le Cri, 2014, which shows Ross mid-scream. Rather than expressing the existential agony of Francis Bacon’s screaming popes, or the terror of Edvard Munch’s, The Scream of Nature, Ross’ scream evokes the power of self-awareness. His scream is not a personification of pain; it is another organic, un-meditated pose, captured by Lagarrigue, which he saw as entry into an exploration of sound in a two-dimensional surface. The numerous reactions the sound triggers write the success, not the intention, of the piece. Therein lays Lagarrigue’s inspiration to paint one individual in an ongoing series, allowing for a continuous study of Ross in order to understand paint’s ability to capture the landscape of skin and the temporality of humanity.